Within our constantly evolving society we often lose touch with the very resources that support us. The levels of burequcracy that remove us from our own food sources blind us to the true nature within which our food is raised and processed. The wretched conditions that these animals are raised in violate the very foundations of ethical treatment and endanger not only them but us as well. The waster from the so-called "factory farms" in which these animals are raised pollutes our waterways and makes its way into our drinking water and crops. 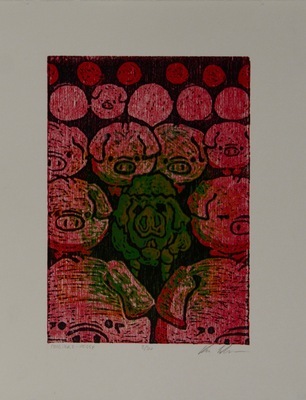 "Prosperi-piggy" seeks to examine the ethical and environmental concerns of factory farming in order to shed light on an issue all-to-often ignored by the general public.